When does a newborn not become a newborn, that's the first question I'd like to ask. The second is, why does no one tell you not to buy so much crap before they are born? Harrison is now closing in on three months old, he's not a newborn anymore, and I think we've had a decent amount of time to figure out what works for us, but also, what doesn't. We've had a good few products that have been holy grail finds for us, and I've talked about them a lot in the past few weeks, but what I haven't talked about, have been the products have been utter wastes of money. 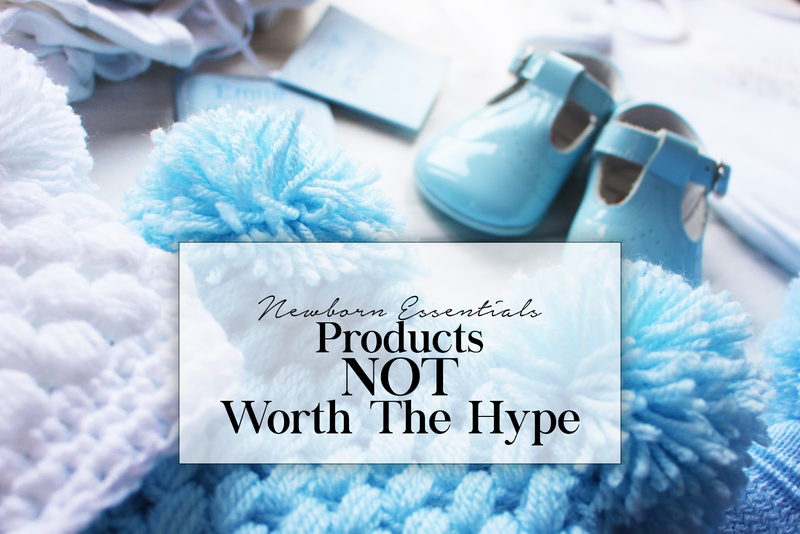 Babies are so individual that this is probably just personal to myself and to Harrison, but if you take anything away from this post, take the fact that babies will not like HALF of the stuff you buy for them. Be careful how much you buy prior to birth - pregnancy is a sure fire time to waste a hell of a lot of money that you do not have to waste. Even now, Harrisons room is overflowing with clothes and products that have never been touched let alone used frequently, and at the minute I can only liken it to the Mothercare January sales... filled with complete crap. It's been all but useless. It's an oversized ornament for next to my Christmas tree at the moment. For me, it was too flat, too cold, too small inside to last more than a few months, and wasn't easy for at night. Transferring from my chest to the basket was next to impossible - It was useless. Beautiful looking, but absolutely no use to me in terms of newborn essentials. If I could offer one piece of advice to anyone currently pregnant, it would be to think carefully about what you want to use for sleeping, and I'd recommend buying only one at the start, only when necessary buy a second option. The Moses Basket was ours, our first being our side sleeper with a baby nest, and we simply use the nest during the day. The moses has never even been used, and that seems to be the case with a lot of new mums I've talked to. I tried these for our first two nights, and they just didn't work. At £25 each they weren't exactly cheap, and I bought enough to last me the entire newborn stage, and we can't even use them. Again, depending on how your baby sleeps will completely determine what you use at night. I bought bags from Jasper Conran because my own mum had used them on my brother - failing to take into account the fact that my brother was a completely different baby from Harrison. Harrison has a really strong Moro reflex - the startle reflex that wakes newborns up - and would wake himself up every few minutes if his arms weren't strapped tightly to his body, so can only sleep soundly when swaddled with little to no moving room. Goodbye sleeping bags. They grow so so so so quickly. I didn't believe anyone when they told me - I nodded along, but I didn't believe them, I didn't want to. I wanted to have a wardrobe stocked with all of the little tiny clothes. In fact, I still have a wardrobe stocked with all of the little tiny clothes. It's just a pity my son came out at 8lbs 1oz and a very long baby - he fit into the tiny newborn clothes for about 2 weeks, and now at 10 weeks comfortably fits 3-6 months. I bought 6 little Emilie Et Rose outfits before he was born - he's worn one. ONE, and at £40 each I can't fathom why the hell I thought it would be sensible to buy so many. No designer baby gear, that is now a given. Let me clarify on the hat point - hats WITHOUT ties. I bought 7 or so newborn hats, adorable ones if I do say so, and that doesn't include the 15-20 we were given before he was born (or the other 20 after). No matter how nice a fit on his head, it would slide off within minutes - we assumed they were too big for him, so I put them in a nice little box for a weeks until he grew a little. 5 weeks down the line, not one of them fit him - apart from the single one with ties, that he has lived in since birth (sorry little one!) hats with ties are the way forward! And don't bother with shoes - what a colossal waste of money. I was so bloody exhausted in the first few weeks the last thing I cared about was putting a pair of patent shoes on his little feet. Shoes can wait until their on they are actually up and on their feet. Why did no one tell me Johnsons was a no-go? I have hundreds - literally hundreds of bottles of the varying Johnsons, the lotion, the oil, the wash, talcum and soap. Everyone seemed to fling one (or 10) in the bag, meaning I've not had to buy one bath product since he was born. The issue though is that although it smells nice, Johnsons is so chemically altered it's just not good for a babies skin. Ditto with big brand nappies, even the health visitor recommended Aldi's as opposed to Pampers - again, too much chemicals for little skin. Who'd have thought? Save the money on the nappies if you can, for us, it's been a life saver.